The motor of a small huller is using the motor of about 2kW of the three-phase circuit 200V. The wiring for 200V of the three-phase circuit is necessary to use this. When the wiring for the three-phase circuit is drawn in, the low-tension power is contracted to the electric power company. I did not contract a low-pressure electric power, thought it was using the three-phase circuit 200V, and made the power supply using a on the market industrial inverter. It introduces the setting of the inverter that converts 200V of the single phase into 200V of the three-phase circuit and the peripheral circuitry. This can not be limited to the huller, and be applied to electrical machinery and apparatuses using the three-phase circuit 200V power supplies such as the compressor, the rice-polishing machines, and the grain dryers. However, it is necessary to remodel the switch of the motor to do on the inverter side. Otherwise, the start current of the motor becomes excessive. 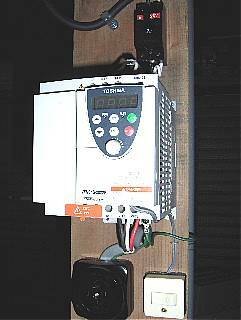 The inverter is industrial inverter VFNC1S-2022P of Toshiba. The motor is the one of three-phase circuit 200V1.9kW. The inverter in the state of buying it is set for three-phase circuit 200V2.2kW. Moreover, it was necessary to start a motor by operating the panel while bought, to stop, and to operate it with an external switch, to have changed the parameter. It makes it to "Set monitor mode" pushing the "MON" button while driving is stopping. The parameter is chosen with "Ups and downs" button. "ENT" The parameter value before is called pushing the button. The parameter value is changed with "Ups and downs" button. "ENT" The value after it changes pushing the button is written. "MON" It returns it to the standard monitor mode pushing the button twice. Cn0d 1 0 The panel operation is changed to the terminal stand. The outlet with 20A breaker of 2P2E and the three-phase circuit 20A earth and switches for the driving stop were installed in an industrial inverter on the market. It wires CC and F of the terminal stand for this switch. This electric wire used the single track for the telephone construction. This switch becomes "Stop" short because of "Drive" opening. Do not use the capacitor for the power factor improvement. Do not operate the switch of the motor while driving the inverter. The main body It operated well though it was thought safe with W=117 H=142 D=155 because it was very small. It changes smoothly from 0 to 60Hz at about ten seconds if the motor starts. In a word, the motor is starting feeling in software. The speed gradually falls on the stop similarly at about ten seconds. When the overload hangs to the motor, it is protected with the electronic, thermal protection circuit. When the motor stopped by the overload, the inverter stopped at once. The rotation of the motor is freely changed by VR of the main body though the huller need not drop the rotation of the motor. It seems to be unnecessary for the huller though it seems to provide other various functions still any further. Anyway, it can make cheaply and well and is large satisfactory. Though there is no said thing if it lasts long.